As one of the world’s biggest car manufacturers, Toyota has been involved in motorsport from its foundation 80 years ago (1937), but the notable presence of the Japanese manufacturer in the international motorsport started in the early 1970s. Since then, Toyota participated in many world championships, international, regional and national competitions, leaving a trail through numerous wins and championship titles. Currently, Toyota Motorsport participates in the FIA World Rally Championship and FIA World Endurance Championship. When it comes to national level, the most notable Toyota’s present competitions are Japanese Super Formula, Japanese Super GT Series and NASCAR. The most notable results are four drivers’ and three manufacturers’ titles in the World Rally Championship between 1990 and 1999. Toyota’s WRC champions were Carlos Sainz (two times), Juha Kankkunen and Didier Auriol. After leaving WRC, Toyota switched to Formula One in 2002, participating until 2009. Toyota’s best F1 result was the fourth place in 2005 season. In eight F1 seasons, Toyota drivers scored no wins, only 13 podiums. Toyota was present in a sports car racing for decades, both as an engine supplier and manufacturer, reaching its peak in the 2014 FIA World Endurance Championship, taking both drivers’ and manufacturers’ titles. At 24 hours of Le Mans, Toyota participated many times but never scored a victory. The man who started Toyota’s international motorsport programme was a Swedish rally driver Ove Andersson, who participated at 1972 RAC Rally with Toyota Celica 1600 GT. Next year, when the World Rally Championship was established, Andersson continued to use Celica among other cars, with Jean Todt as a navigator. In 1974, Andersson Motorsport was renamed to Toyota Team Europe, moving the headquarters from Sweden to Brussels, Belgium. In 1975, Andersson was driving mostly Toyota Corolla, scoring first WRC podium at Rallye de Portugal. The maiden WRC victory for Toyota followed in the next event, at 1000 Lakes Rally, where Hannu Mikkola was driving the #1 Toyota Corolla Levin TE27. In the next couple of years, Andersson and Mikkola earned several WRC podiums for Toyota (Portugal, Finland, UK). From 1977, their car was Toyota Celica 2000 GT. In 1978, Toyota Team Europe moved its base to Cologne, Germany. Year by year, the facility in Cologne expanded to purpose-built motorsport factory and Toyota Motorsport still today has its headquarter there. In the 1980s, Bjorn Waldegard was the first driver who scored WRC podium with Toyota, finishing third at 1981 Rallye de Portugal. Next year, after seven years of waiting, Toyota gained WRC victory, with Waldegard winning the 1982 Rally New Zealand. His streak of wins continued with 1983 Rally Cote d’Ivoire, 1984 Safari Rally, 1986 Safari Rally, 1986 Rallye Cote d’Ivoire and 1990 Safari Rally. Juha Kankkunen joined Toyota in 1983, driving the Toyota Celica Twincam Turbo, the 320-hp Group B rally car. Kankkunen’s first win for Toyota came at 1985 Safari Rally. Later in the season, he added one more win at Rallye Cote d’Ivoire, proving that Toyota is the most successful manufacturer at African events. In the post-Group B period, Toyota’s Group A rally cars were Supra 3.0i and Supra Turbo. With Supra Turbo, Lars-Erik Torph scored a podium at 1987 Safari Rally. In 1988, Toyota Celica GT-Four was introduced, becoming one of the most successful rally cars ever. Kenneth Eriksson and Juha Kankkunen were the main drivers, with Bjorn Waldegard participating in three WRC events. Waldegard was the first one who reached a podium with Celica GT-4, finishing third at 1988 RAC Rally. In 1989, Toyota Team Europe became the championship contender, finishing second in the points, behind Martini Lancia. With one victory and two podiums, Juha Kankkunen finished third in drivers’ standings. The first great success came in 1990 when Carlos Sainz became the world championship and brought the first title to Toyota. That year, he scored four wins and five podiums with Toyota Celica GT-Four ST 165, dominantly taking the title. The team was second in the points again. The success in 1990 was just a beginning of a decade that was definitely marked by the Japanese manufacturers because Toyota, Subaru and Mitsubishi collected seven manufacturers’ titles and nine drivers’ titles from 1990 to 1999. Toyota was the most successful brand in that period. Carlos Sainz added one more title to his account in 1992, followed by Juha Kankkunen in 1993 and Didier Auriol in 1994. Toyota gained double success in 1993 and 1994, as the team captured manufacturers’ titles too. The third manufacturers’ title came in 1999, the last year of Toyota’s participation in the WRC. Besides victories and titles, the 1990s were also marked by one milestone event and by one controversial WRC season. In 1993, Toyota bought a team from Ove Andersson, leaving him as a team principal, renaming a company to Toyota Motorsport GmbH, with a headquarters in Cologne, Germany. Since then, TMG is a parent company for all Toyota’s motorsport projects, providing services to factory teams and private teams that use Toyota cars all around the world. Today, the company employs around 200 people and works in a 30,000m2 factory. The 1995 WRC season will be always remembered as the darkest period of Toyota’s motorsport history. After winning two consecutive titles, Toyota Castrol Team was again among the leading teams in a championship, with Juha Kankkunen, Carlos Sainz, Armin Schwarz and Thomas Radstrom collecting one win and six podiums in six WRC events. And then, at Rally Catalunya, the team was caught to use illegal turbo restrictors. The team and the drivers were stripped of the points they collected in 1995. FIA also gave a 12-month ban to the team. After skipping the 1996 WRC season, Toyota returned in 1997, when the first generation of World Rally Cars was introduced. Toyota was running the Corolla WRC for two more full seasons, scoring four wins and taking the manufacturers’ title in 1999. Carlos Sainz and Didier Auriol were the drivers. At the end of 1999 season, with freshly deserved WRC trophy, Toyota withdrew from the championship. They returned in the 2017 WRC season, introducing Toyota Yaris WRC. Toyota announced its move to Formula One in January 1999, while still competing in the WRC, but the preparations lasted until 2002. Toyota opted to start their own team, to build their own chassis and use their own engine, rather than cooperate with some of the specialized chassis manufacturer or team. Ove Andersson has been chosen to lead the team. Panasonic Toyota Racing debuted in the Formula One in the first round of the 2002 season, at Australian Grand Prix. Mika Salo and Allan McNish were appointed as drivers of #24 and #25 Toyota TF102 cars, powered by the 3.0L V10 engine. Mika Salo earned one point in debut race, finishing sixth. He added sixth place at Brazilian Grand Prix and that was all for the first season. Toyota finished 10th among 12 teams. In 2003 Formula One season, Olivier Panis and Cristiano da Matta were driving #20 and #21 Toyota TF103 cars. With only seven points-finishing results, Toyota ended a season in the 8th place. That wasn’t a satisfying result for a well-funded factory team. Panis and da Matta started the 2004 F1 season with Toyota but neither one finished a season with a team. The Brazilian left after twelve races and disappointing performances, while Panis announced a retirement and missed the last race in Brazil, to allow his teammate Ricardo Zonta to participate in front of his home crowd. Prior to that, Zonta stepped in as a replacement for da Matta in five races while Jarno Trulli participated in two races. Jarno Trulli became the main driver in 2005 F1 season, driving the #16 Toyota TF105 alongside Ralf Schumacher in the #17 car. It was the best season for Panasonic Toyota Racing, as Trulli and Schumacher collected five podiums to place the team in the fourth place of the constructors’ championship. The maiden podium came at 2005 Malaysian Grand Prix, where Trulli finished second behind Renault’s Fernando Alonso. Trulli was second again in Bahrain, one more time behind Alonso. Trulli and Schumacher spent three seasons together. After a successful 2005 season, they scored only one podium in 2006 (Schumacher in Australia) and finished 6th in the manufacturers’ classification. The team repeated the sixth place in 2007, again with Trulli and Schumacher, but without podium results. For the 2008 F1 season, Toyota retained Jarno Trulli and added reigning GP2 champion Timo Glock to the line-up. They scored two podiums, Trulli was third in France and Glock finished second at Hungaroring and then finished fifth in the constructors’ points. Five podiums and a fifth place in the championship are the numbers in the 2009 Formula One season, the last one for Toyota. Trulli participated in all races while Glock was injured at the Japanese Grand Prix and replaced in the last two rounds with Kamui Kobayashi. As the team’s parent company recorded financial loss in 2009, the Japanese team withdrew from the premium single-seater competition at the end of 1999. In eight seasons, the team recorded 139 F1 Grand Prix starts, scored three pole positions and 13 podiums. Besides running its own team, Toyota was also an engine supplier to other teams – Jordan in 2005, Midland in 2006, Williams from 2007 to 2009. After leaving Formula One, Toyota returned to the world championship in 2012, entering the revived FIA World Endurance Championship, fielding two Toyota TS030 Hybrid prototypes in the LMP1 class, against Audi factory teams and few private teams. One of those teams, Rebellion Racing, was using Toyota engine in its Lola chassis. Toyota Racing had an FIA WEC debut at 2012 Le Mans 24h, returning to the Circuit de la Sarthe for the first time since 1999. Alex Wurz, Kazuki Nakajima and Nicolas Lapierre were driving #7 car, retiring after 134 laps. Anthony Davidson crashed out with #8 car after 82 laps. His co-drivers were Sebastien Buemi and Stephane Sarrazin. After Le Mans, the #7 car participated in all races until the end of the season, winning three times (Sao Paulo, Fuji and Shanghai). Wurz and Lapierre finished third in the drivers’ standings. In the 2013 FIA WEC season, both cars participated full season. The #7 won at Fuji Speedway, the #8 won the season-closing race in Bahrain. The #8 crew (Anthony Davidson, Sebastien Buemi, Stephane Sarrazin) finished third in the points. For the 2014 FIA WEC season, Toyota introduced TS040 Hybrid, again fielding two cars throughout the entire season, against Audi and Porsche. Sebastien Buemi and Anthony Davidson were the winners four times with #8 car, at Silverstone, Spa-Francorchamps, Fuji and Shanghai. The #7 added one victory, in Bahrain, to help Toyota gain manufacturers’ championship for the first time. In the drivers’ standings, Buemi and Davidson took the title ahead of Audi’s trio Lotterer/Fassler/Treluyer, who won at Le Mans. In the 2015 FIA WEC season, Porsche dominated and clinched both titles. Toyota scored no wins for the first time since 2012, taking only two podiums. In 2016, Toyota TS050 Hybrid scored only one win, at Toyota’s home round at Fuji Speedway, with Stephane Sarrazin, Kamui Kobayashi and Mike Conway in the #6 car. The crew in the #6 Toyota TS050 Hybrid (Sarrazin/Kobayashi/Conway) finished in second place at 2016 24 hours of Le Mans. The team was so close to victory because the #5 car was leading until the last lap, when an engine broke down and Kazuki Nakajima had to stop, handing a victory to Porsche Team. 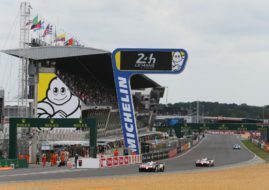 In the previous Le Mans attempts between 2012 and 2015, the best result was the second place in 2013 for Buemi, Davidson and Sarrazin. In 2014, Buemi/Davidson/Lapierre finished in third place. In 2015, the best-placed Toyota crew was Wurz/Sarrazin/Conway in the sixth place. Before entering FIA WEC in recent years, Toyota factory team had previously recorded one podium at Le Mans, in 1999, with Toyota GT-One prototype. Toyota GT-One was the fastest car on the grid in 1999, taking pole position, setting the fastest lap during the race and the biggest speed (352 km/h) on the straight, but it wasn’t good enough for the victory. BMW Motorsport’s BMW V12 LMR took the win ahead of #3 Toyota GT-One, driven by Ukyo Katayama, Keiichi Tsuchiya (the grandfather of drifting) and Toshio Suzuki. The other two cars (#1 and #2) failed to finish the race. Martin Brundle had an accident in #1 car, Thierry Boutsen had a high-speed crash with #2 car. A year before, in 1998, only one out of three Toyota GT-One cars finished the race, with Katayama/Suzuki/Tsuchiya in ninth place. Two Le Mans attempts in 1998 and 1999 were supported by German-based Toyota Motorsport but Toyota was also present at Le Mans earlier, during the 1980s and 1990s, through the different factory-supported or private teams, scoring some notable results. In 1992, Toyota Team Tom’s finished second with Toyota TS010. Two years later, Team SARD finished second with Toyota 94C-V.
Toyota’s Le Mans efforts dated back to 1985, with Dome prepared Group C cars. Factory supported Team Tom’s competed in the World Sportscar Championship for many years until 1994. Team SARD was the last private team that participated at Le Mans with Toyotas, in 1995 and 1996, fielding Toyota Supra LM and own-built SARD MC8-R, which was, in fact, the modified Toyota MR2. In the American sports car racing, Toyota appeared in the IMSA GT Championship during the 1980s, with private teams using Toyota Celica in the GTU class. In the following period, Toyota was an engine supplier for different teams and different prototypes, such as Eagle HF89 or Eagle Mark III, which captured IMSA championship titles in 1992 and 1993. All American Racers also won Daytona 24 hours in 1993, using Toyota-powered Eagle Mark III. That was the only Daytona win for Toyota. In the Grand-Am Series, Toyota and Lexus regularly appeared as engine suppliers. In the American premium single-seater competition, Toyota was present for ten seasons, from 1996 to 2005. In 1996, Toyota entered the CART Indy Car World Series as an engine supplier for Dan Gurney’s All American Racers team, but also for Arciero-Wells Racing. The first notable result followed in 1999 when Scott Pruett joined Arciero-Wells Racing to drive Reynard 99i-Toyota. He scored the pole position in the last race of the season at California Speedway. The maiden victory followed in 2000 at Milwaukee Mile, where Juan Pablo Montoya won the race with Chip Ganassi Racing’s Lola-Toyota. After five wins for Toyota-powered cars in 2000 and six wins in 2001, Toyota finally won the Manufacturer’s title in 2002. Cristiano da Matta became the champion, driving the Lola-Toyota for Newman/Haas Racing. The second-placed Bruno Junqueira, the driver of Chip Ganassi Racing, was also driving Lola-Toyota. In 2003, Toyota moved to IndyCar Series, providing factory support to former CART teams Team Penske and Target Chip Ganassi Racing, but also working with few more teams. The winning car of Scott Dixon and Indy 500 winning car of Gil de Ferran had Toyota engines, which was the peak of Toyota’s presence in the American open wheel racing. However, the seasons of 2004 and 2005 were not so good, because Honda outshined Japanese rival. Following the 2005 IndyCar Series, Team Penske and Target Chip Ganassi Racing announced they would switch to Honda engines, leaving Toyota with no championship contenders. As a result of this and their intent to re-allocate resources for NASCAR, Toyota announced withdrawal from the IndyCar Series. Toyota entered NASCAR in 2004, preparing Tundra for the Truck Series. In 2006, Todd Bodine brought the first ever NASCAR title to the Japanese manufacturer, winning the Craftsman Truck Series. Since then, Toyota drivers captured nine Truck Series titles (until 2016). After winning among trucks, Toyota was ready to enter the premier NASCAR competition in 2007. The first teams to run Toyotas in the Cup Series were Michael Waltrip Racing, Team Red Bull and Bill Davis Racing. Toyota also appeared in the Busch Series, taking maiden victory at O’Reilly Raceway Park in July 2007, with Jason Leffler driving Toyota Camry for Braun Racing. In 2008, Joe Gibbs Racing, one of the major teams, switched to Toyota. A maiden Cup Series win came soon, in the fourth round of the season at Atlanta Motor Speedway, with Kyle Busch in the #18 Toyota Camry. Until the end of the year, Toyota Camry visited Victory Lane nine more times. Since then, Toyota established itself as a regular winner in the NASCAR’s top series. The first Cup Series drivers’ title, came in 2015 and Kyle Busch became a champion. A year later, in 2016, Toyota won the Manufacturers’ championship for the first time. Toyota is a Japanese manufacturer, so there is no need to emphasize that Toyota is included in all sorts of motorsport competitions in its home country, from junior single-seater competitions and Super Formula on one side to Super GT Series on another. Toyota captured its first Formula Nippon title in 2006. Since then, Toyota collected nine championship titles, the last one in 2016, when Yuji Kunimoto became the Super Formula champion. In the premier GT championship, the first title was taken in 1997. Since then, four titles in GT500 class and six titles in GT300 class went to Toyota. To this number, we have to add five titles captured by Lexus. Today, Toyota Motorsport GmbH is not only a team that runs WRC and WEC programmes for the Japanese car manufacturer, because TMG provides various services for all members of Toyota family but also for external clients. TMG in Cologne is a unique high-performance testing and development facility, specializing in high technology. TMG has developed into a one-stop shop for specialized services, not just from the automotive world but from most sectors. Under one roof, you can find a variety of race cars, from space-technology Toyota Hybrid prototypes to rally cars of all class. On the top is Yaris WRC, but Toyota is also producing more affordable cars, such as Toyota GT CS-R3.